12-year-old Dovid Moskovits was the 2012 winner of the Jewish Star International Music Competition. After the competition, he released a music video of the award-winning song, Adon Olam. 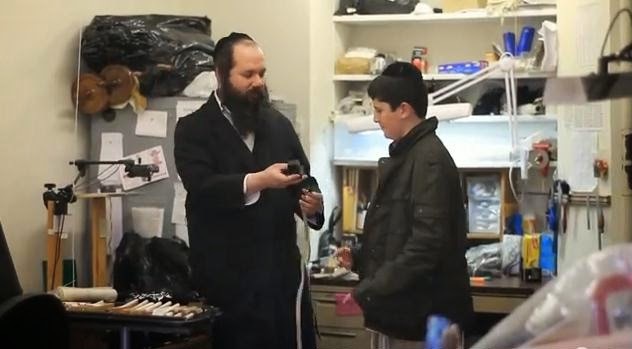 The video captures Dovid on a journey -- spiritual and practical -- to meet the Sofer (scribe) who did the intricate calligraphy on the parchments enclosed in the tefillin.. The story follows Dovid from his house in Kew Garden Hills, NY through the streets of ethnic Williamsburg as he journeys to the Sofer's workshop. The shots of the Sofer working diligently at his task tell the story of an ancient and mystical craft. The moving film captures the spirit of a 12 year old boy on a quest to achieve manhood and prepare for his Bar Mitzvah. Dovid, a yeshiva student in Queens, was born in Jerusalem and has been singing since the age of 3. Linguists among our readers will notice how Dovid's Hebrew pronunciation changes from Israeli-Sefaradit to Ashkenazis as he walks the Brooklyn streets and back to Sefaradit at the conclusion of the song. NOW I understand why tefillin cost so much!